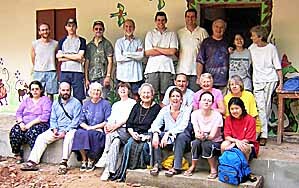 Our first AidCamp in January 2003 had provided an extension for SCAD's boarding school for handicapped children. These two projects in January and February of 2004 financed the rebuilding of the original part of school, which was in poor repair and becoming a maintenance problem. 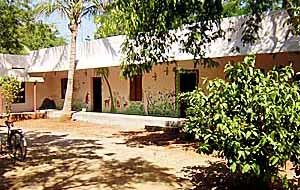 The major construction was completed by local labourers, paid for by the AidCamps, before the first group arrived, providing a 270sq.m (3000sq.ft) classroom block -- about 25% bigger than the building it replaced. The volunteers plastered, painted and decorated the building, with the first group finishing the outside and the second group the inside. The outside was decorated with a playful "musical animals procession" mural, while the inside was rendered with an educational "countries of the world" theme in the main part and a maritime theme in the physiotherapy room. Volunteers also got involved with several other activities on the SCAD campus, including helping out in the school and teaching conversational English to students at SCAD's further education colleges. "From the moment I found the advertisement for AidCamps, I had a good feeling. The website whetted my appetite further, as did the testimonies of those who had been on the various projects before. Signed, sealed, and safely delivered to India, I realised that I'd probably raised my expectations too high and the only way was surely down. I couldn't have been more wrong. The next three weeks were magical. 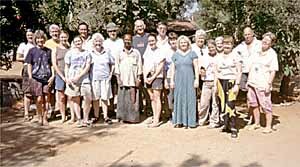 For those in the group of 20 volunteers who had not been to India before - more than half - the first couple of days acclimatising in the large coastal town of Trivandrum were invaluable. While we all got to know each other we also were introduced at leisure to the intoxicating sensory overdose that goes hand in hand with a stroll through real India. The smells, the noise, the inquisitive glances, the roller coaster rickshaw rides and the heat - it all felt new, at times bewildering, but never anything less than exciting. And so on to the project at the SCAD campus. After an unexpected and charming welcome ceremony from the staff and children, we settled in to our home for the next three weeks. The accommodation was dormitory style, perfectly comfortable, and I couldn't have asked for three better roommates. Meals were outstanding. The kindness of those looking after our needs throughout is something that won't be forgotten. Our project work was to finish the exterior of the new school building for the handicapped children. This involved four hours of plastering and painting most mornings. No-one had any noteworthy experience of these matters before but after a couple of mornings, we all were swapping technical tips like Bob the proverbial builder. It was great fun, never a chore. We all wanted to do a good job and the spirit with which everyone joined in was uplifting. People also got involved in various other activities in and around the campus. Some assisted on the physiotherapy for the kids with polio, others taught English, trips were organised for those with medical experience to visit local hospitals, we even organised a game of cricket against the older college students! Everyone found their own way of contributing as much as possible. 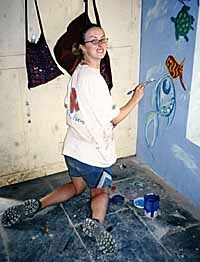 Afternoons were mostly spent in trips to local SCAD projects. The charity does so much to help the lives of the disadvantaged. The abandoned elderly, gypsies, leper communities, to name a few. Most impressive is the way in which people are encouraged to help themselves, whether it be in organising money saving schemes for village women or enabling underpaid workers to stand up for their rights. In a short space of time SCAD has clearly become a major force for good in the area, helping people to a better life in the most trying circumstances. Cletus Babu, the founder of SCAD, and his team deserve nothing but the highest praise for their work and impressed us all with their humility and application. The mixture of work, visits, and sightseeing was a great way to see inside a country too, without ever feeling like a tourist. The volunteers quickly bonded and it was a pleasure to be part of such a great group of people. At the end of the three weeks it was difficult to leave the campus. On the morning of our departure, a little boy with polio I had taught for a few days came up to me and showed me a message he had written on his arm: 'I James love'. I had hardly noticed him in class as I was too busy enjoying myself listening to the kids singing versions of Beatles songs we'd done our best to teach them. The children stole all our hearts. Their courage and unconditioned happiness was inspirational. In a short space of time they had taught us more than we could offer them in a lifetime." "If you want to get an insight into the lives of real Indians and experience the 'real' India then participating in an AidCamp is a must. You get more out than you put in." "I have had an opportunity to move past tourism in to the reality of Indian rural life." "For me, it combined a worthwhile activity with some of the best sightseeing I've ever done." "AidCamps India gave me the opportunity to engage in a range of activities from teaching to painting, this provided a varied and rewarding experience." "Gave a great insight into south Indian rural life and the problems facing poverty striken/disadvantaged groups within that society." "Never have I been so deeply touched. A truly moving experience. It was a privilege to be on this AidCamp." "I'd do it all again tomorrow." "Three weeks packed with rich experiences and much laughter -- especially when words let us down. So much kindness and cooperation -- a wonderful time." "There can be no better way to visit another country and its people -- and in only three weeks! You could spend a lot more on a luxury tour and get nothing like the experience, the insights, the satisfaction, and the fun that I got." "A marvellous way to learn about India and its people in a very short space of time!" "An unforgettable experience beyond my expectations for the amount of time spent in India." "If everybody could experience this trip, the world would be a better place." "You could have been there for a month of Sundays and still not seen or experience anything like we did. There were just too many 'wows' and too many emotional moments to describe." "The best time of my life." "AidCamps made me feel completely in touch with where my charitable contribution was going. I've never felt so close and connected to the peope in the country I travelled to before, it'll be unsatisfactory to travel another way." "I want to take all the children home with me!" "If you want to get an insight into the lives of real Indians and experience the 'real' India then participating in an AidCamp is a must. You get more out than you put in." "I have had an opportunity to move past tourism in to the reality of Indian rural life." "For me, it combined a worthwhile activity with some of the best sightseeing I've ever done." "AidCamps India gave me the opportunity to engage in a range of activities from teaching to painting, this provided a varied and rewarding experience." "Gave a great insight into south Indian rural life and the problems facing poverty striken/disadvantaged groups within that society." "Never have I been so deeply touched. A truly moving experience. It was a privilege to be on this AidCamp." "I'd do it all again tomorrow." "Three weeks packed with rich experiences and much laughter -- especially when words let us down. So much kindness and cooperation -- a wonderful time." "There can be no better way to visit another country and its people -- and in only three weeks! You could spend a lot more on a luxury tour and get nothing like the experience, the insights, the satisfaction, and the fun that I got." "A photographers delight." "A marvellous way to learn about India and its people in a very short space of time!" "An unforgettable experience beyond my expectations for the amount of time spent in India." "Incredible and shocking." "If everybody could experience this trip, the world would be a better place." "You could have been there for a month of Sundays and still not seen or experience anything like we did. There were just too many 'wows' and too many emotional moments to describe." "The best time of my life." "AidCamps made me feel completely in touch with where my charitable contribution was going. I've never felt so close and connected to the peope in the country I travelled to before, it'll be unsatisfactory to travel another way." "I want to take all the children home with me!" "It's not every day you see frogs in the toilet or get sneezed on by an elephant, but in India, nearly every second, you see something memorable. These are some of the things I took photos of: a family of five bombing down a haphazard road on a Honda Hero motorcycle, the woman, in an elegant sari, sitting side-saddle; Hindus throwing butter balls at a god's statue in a temple to bring good luck; a pilgrimage of men who had surrendered their families and jobs, dressed in orange with spears through their cheeks; families doing their washing in rivers. But nothing will stay with me more than my memories of SCAD. When the bus arrived at the campus we were given garlands and anointed with coloured paste on our foreheads by school children. We felt like rock stars. They wanted to chatter in broken English, grab our hands and play. Some of them had polio and they couldn't walk. This didn't stop them joining in. And their smiles made you melt. I spent some time in the physiotherapy room. It wasn't like one over here; it had sandbags on pulleys for weights, and a rope swing so children could build up their arms. One tiny boy had come to SCAD six months ago, after doctors had said he would never walk. His wasted legs had been furled under his body and he crawled everywhere. But through physiotherapy his legs had been released from the spasm. One leg was strong, and he could hobble with a stick. I have never felt so moved and overwhelmed by someone's spirit and strength. When we weren't at the campus we visited other villages where SCAD worked. We visited a quarry and saw the daintiest women, looking beautiful in immaculate saris smashing huge rocks with a sledgehammer. They do this from seven till five every day, in temperatures around 35 degrees. Then walk home five miles, and cook the family's dinner. They earn 60 rupees a day for this - less than a pound. We went to a gypsy village. Some of the group made a living catching snakes. They showed us their missing fingers. 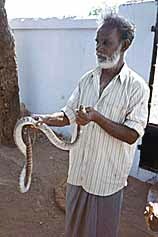 They had to cut them off with machetes if they were bitten - before the venom spread. The men had long hair (everywhere else, men had carefully oiled quiffs with neat moustaches) and kids ran around with no clothes - they were wild. Some girls danced for us; they balanced a pot on their head whilst they picked up a ten rupee note with their eyelashes and a handkerchief with their teeth. In sharp contrast was the leprosy village. Sufferers and their families were subdued and shy. One man was wearing trainers, as his feet wouldn't stay in sandals. They were lucky because most people with leprosy are outcasts and have nowhere to live. In the next village an old man's thumb had rotted away with disease; it looked like tar. We met the most outstanding woman imaginable. She was 85, blind, had goitre and lived in a water tank - and had done so for seven years. She was incredibly unfortunate, but this didn't stop her smiling, singing, and calling upon her gods to wish us a long and happy life. The care and welcome during our stay from SCAD and the children was humbling. On the last night, the school put on a cultural evening with dancing singing and amazing costumes. It was mesmerising stuff. One girl, dressed in a beautiful red sari and jewellery, performed a dance that had taken her nine years to master. It was the most intricate thing I had ever seen. One boy, a dance master, wore a tiara and full make-up to give his performance. Mind blowing. On the last morning, the children opened the school that we had decorated. They boiled milk as a special blessing and sang. It was hard to say goodbye. And I'll miss the other volunteers too -- they were fantastic fun and great company. But perhaps we won't miss the frogs." "The most fantastic three weeks -- fascinating, rewarding, and moving -- a definite must!" 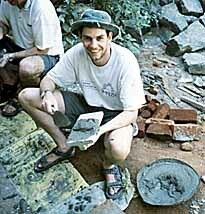 "A truly wonderful experience -- you see the real India." "I would recommend it to anyone who is interested in the developing world, from 18 to 75." "I have never seen so many smiling faces." "It gives great satisfaction to know you've made a difference in people's lives." "A fantastic experience that I will never forget." "Everyday brings a new stunning experience. And every day reinforces the same message -- that the people of Tamil Nadu value themselves and value each other; they tolerate and they smile despite the most enormous odds." "Wouldn't have missed it for the world!" "It was a privilege to be around the handicapped children who are so cheerful." "We came back for more and weren't disappointed. Even better than last year." "I head read what a fantastic experience the camp was and I wasn't disappointed. It was every bit as good as I'd hoped." "Second time to AidCamps' Indian partner -- just as inspiring and really great to see old friends again." 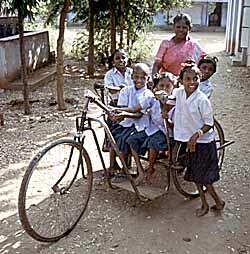 "The AidCamp was a great way to learn something of the joys and problems of life in Tamil Nadu. Although I've seen many sad and upsetting sights, one of the strongest images I will take home is of happy, friendly faces, wreathed in smiles." "A glimpse of the soul of India that touched the heart." "A real taste of Tamil Nadu, its people, culture and landscape, in tandem with support for a worthy community cause." "Fantastic experience with opportunities you would not be able to have elsewhere." "The most fantastic three weeks -- fascinating, rewarding, and moving -- a definite must!" "A truly wonderful experience -- you see the real India." "I would recommend it to anyone who is interested in the developing world, from 18 to 75." "I have never seen so many smiling faces." "It gives great satisfaction to know you've made a difference in people's lives." "Undescribably brilliant!" "A fantastic experience that I will never forget." "Everyday brings a new stunning experience. And every day reinforces the same message -- that the people of Tamil Nadu value themselves and value each other; they tolerate and they smile despite the most enormous odds." "Wouldn't have missed it for the world!" "Humbling." "It was a privilege to be around the handicapped children who are so cheerful." "We came back for more and weren't disappointed. Even better than last year." "I head read what a fantastic experience the camp was and I wasn't disappointed. It was every bit as good as I'd hoped." "Second time to AidCamps' Indian partner -- just as inspiring and really great to see old friends again." 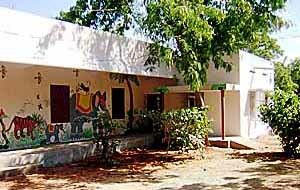 "The AidCamp was a great way to learn something of the joys and problems of life in Tamil Nadu. Although I've seen many sad and upsetting sights, one of the strongest images I will take home is of happy, friendly faces, wreathed in smiles." "A glimpse of the soul of India that touched the heart." "A real taste of Tamil Nadu, its people, culture and landscape, in tandem with support for a worthy community cause." "Fantastic experience with opportunities you would not be able to have elsewhere."